I recently upgraded to an iPhone and now can’t imagine living without it. I use it to track my running, as a calendar, to look up recipes while at the supermarket, to post photos to Facebook, and my addiction is growing by the day. Are you the kind of person who uses their iPhone for everything? 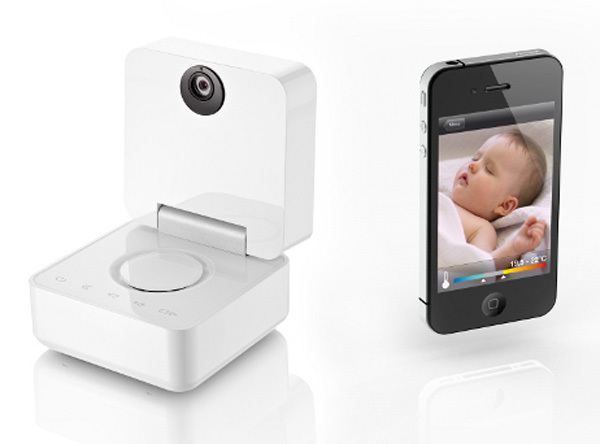 Why buy a separate baby monitor then when you can turn your iPhone into one with a Withings Smart Baby Monitor camera? The device works by using a “smart sensor”, which is a high resolution 3MP camera with extra wide lens and night vision infrared LEDs. This compact smart sensor can communicate with any existing connected screen via bluetooth, WiFi or standard wire connections, turning your iPhone, iPad, computer, LCDTV or any similar device into a baby monitor. With temperature and humidity info, a two-way microphone so you can talk to your little one, music controls for lullabies, and alarms that can be set to alert you to any changes in the room, it pretty much does it all – from anywhere in the world. Its sleek white Apple-inspired design means it will also look very smart in any nursery. French start-up Withings are not the only company to cotton on to the idea of using your iPhone as a baby monitor and certainly won’t be the last – Baby Safe also have a great app reported here last year that allows you to check in on your little one from almost anywhere in the world. The Withings Smart Baby Monitor is scheduled to be released in March this year and stockists will be posted on their website. It has already received two awards from Observeur du Design 2011 and two awards during the Consumer Electronics Show 2011.